Ten years ago today, a little mystery novel about murder, conspiracy and the history of Christianity was published and began its steady climb to becoming a best-selling titan of its genre and a magnet for controversy. Dan Brown’s “The Da Vinci Code” captured the imagination of readers beguiled by the quest for the Holy Grail, the cryptic intricacies of the paintings of the great masters, and the shadowy practices of secret orders. Some historians balked at the book and several high-ranking church officials from a variety of denominations took exception to it. But in short order, Brown’s story of the exploits of intrepid Professor Robert Langdon and police cryptographer Sophie Neveu, who parsed ancient clues that seemed poised to upend core beliefs of the Christian faith, became a publishing sensation. In the decade since “Da Vinci” first hit shelves, it’s become a cultural phenomenon. According to publisher Doubleday, Brown's book spent 144 weeks on the New York Times hardcover fiction best-seller list; has been translated into 51 languages, and has sold more than 81 million copies worldwide. Unsurprisingly, Hollywood was swift to come calling after the book’s initial boom and a major motion picture of Brown’s thriller (directed by Ron Howard and starring Tom Hanks and Audrey Tatou) arrived in movie theaters in 2006. To mark the book's birthday, we thought we’d take a look back at Dan Brown’s very first national television interview, which he gave to TODAY on Sept. 15, 2009, on the eve of the release of his first follow-up to "The Da Vinci Code," "The Lost Symbol." In speaking of the pressures, expectations and the criticism from fans and detractors alike, Brown remained stoic. "I just have to write the book I would like to read," he told Matt Lauer, "and hope that other people are going to share my taste." Watch the entire interview below. Sept. 15: TODAY's Matt Lauer speaks exclusively with author Dan Brown about his rise to fame and his highly anticipated new novel, "The Lost Symbol." Sept. 15: Dan Brown talks exclusively with Matt Lauer about the Freemason organization. Sept. 15: Dan Brown talks exclusively with Matt Lauer: "Langdon's the guy I wish I could be." Sept. 15: Dan Brown talks exclusively with Matt Lauer on the critics' reactions to his books. Sept. 15: Dan Brown talks exclusively with Matt Lauer about his biggest pressure when writing "The Lost Symbol." 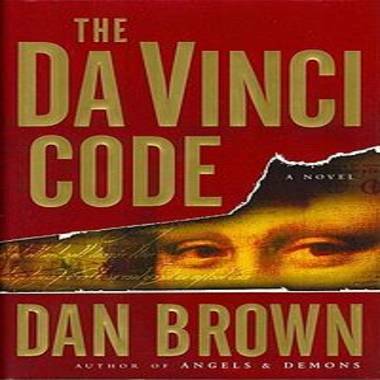 To celebrate the anniversary of “The Da Vinci Code,” Doubleday is announcing a free digital download of the book along with the prologue and first chapter of “Inferno,” Brown’s next thriller. For more information, visit Danbrown.com.